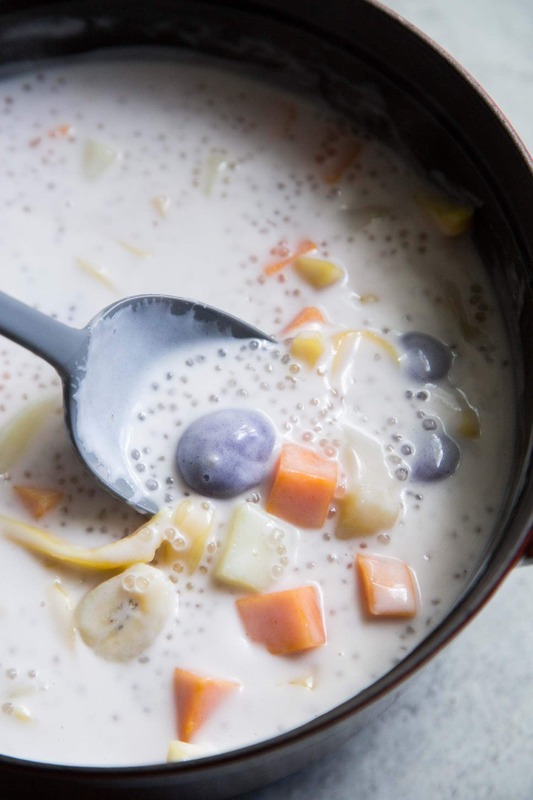 Ginataang bilo bilo is a sweet coconut based dessert soup with tapioca, chewy rice balls, and a variety of fruits and tubers. October is Filipino American History Month. This month pays homage to the the many ways Filipino Americans have contributed to American history- from serving in World War II to the formation of the United Farm Workers Union. My parents immigrated to the United States in the 70s. I was born and raised in California. Throughout my childhood, we visited the Philippines every summer. Tagalog (Filipino) was my first language and I consider myself just as much Filipino as I do American. To help commemorate FAHM, Rezel of Razel Kealoha has brought together several Filipino American food bloggers for a Virtual Merienda! Merienda (also spelled meryenda) is a snack eaten between meals. It can take place mid-morning between breakfast and lunch or mid-afternoon between lunch and dinner. Dishes served at merienda can be sweet or savory. It can be something light and simple like warm pandesal with a cup of coffee or tsokolate. Or something a bit more heavy and substantial like arroz caldo or chicken sotanghon soup. My contribution to this virtual merienda is ginataang bilo-bilo! This was one of my favorite desserts growing up. We would only serve it during special occasions, mainly during Christmas. This recipe makes a large batch and it is meant to shared. The word “ginataan” (also spelled guinataan) refers to anything cooked or stewed in coconut milk (gata). There are many, many version of ginataan, ranging from sweet to savory. Examples: Ginataan na hipon (shrimp with coconut milk) and ginataang kalabasa at sitaw (squash and long bean with coconut milk). 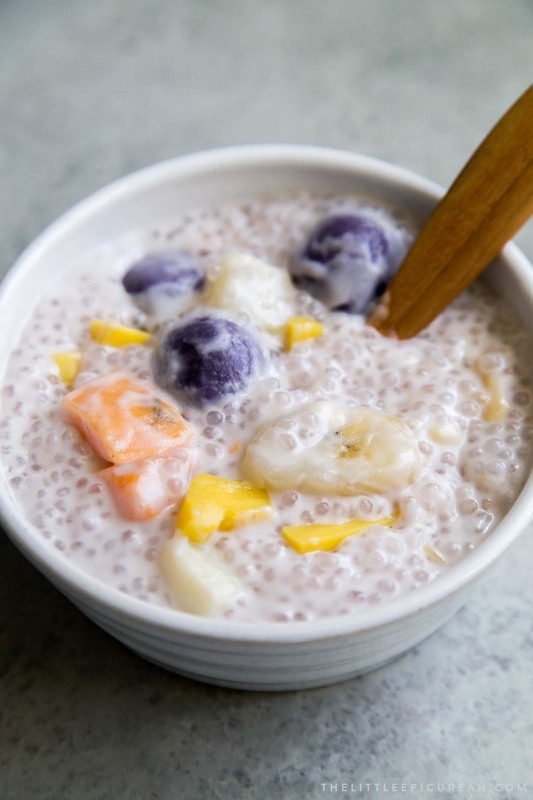 My version contains small tapioca pearls, saba bananas, sweet potato, and jackfruit. Bilo-bilo is super easy to make. This version is flavored with ube extract and powdered purple yam. To make plain ones, simply use sweet rice flour and water. Sweet rice flour is also known as glutinous rice flour. One of the more popular brands that you’ll be able to find most supermarkets is Koda Farms Mochiko. You should be able to find this one brand. I’ve even seen it for sale at Target. The rice flour is mixed with water until it forms a pliable dough. The dough is portioned into round balls and set aside until ready to cook. Saba bananas are native to the Philippines. They can be best described as a cross between a standard banana and a plantain. They’re best known for making turon (Filipino fried banana rolls). Saba bananas can be eaten raw, but they taste best when cooked. Picked from the tree, they will be bright green. 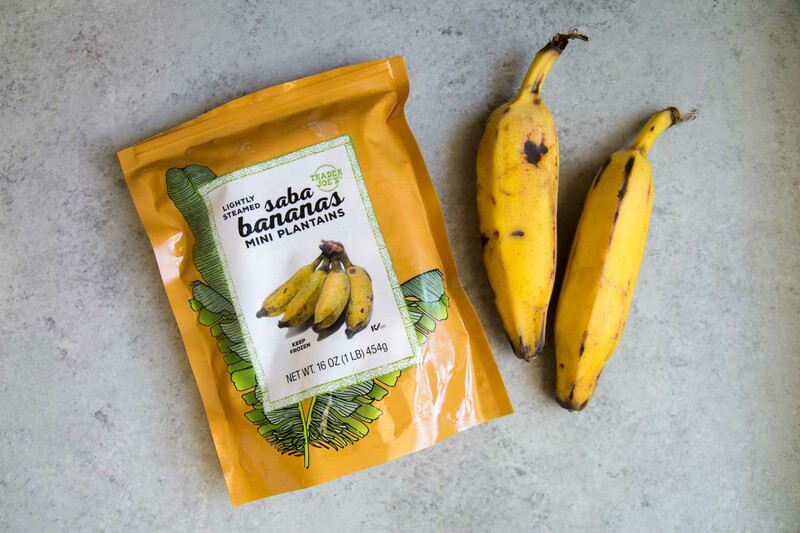 The saba bananas are ripe and ready to be eaten once they’ve softened, turned golden yellow, and black spots/marks begin to appear. 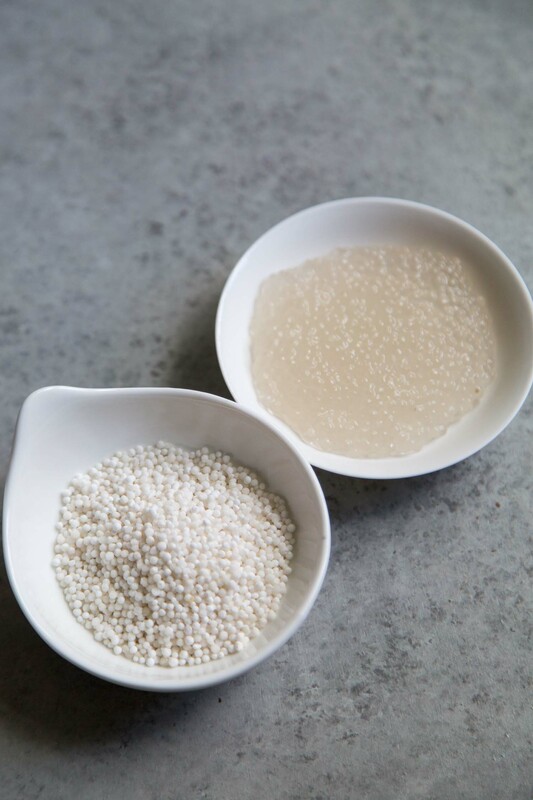 How to cook small tapioca pearls? Tapioca pearls are made from tapioca starch extracted from cassava root. 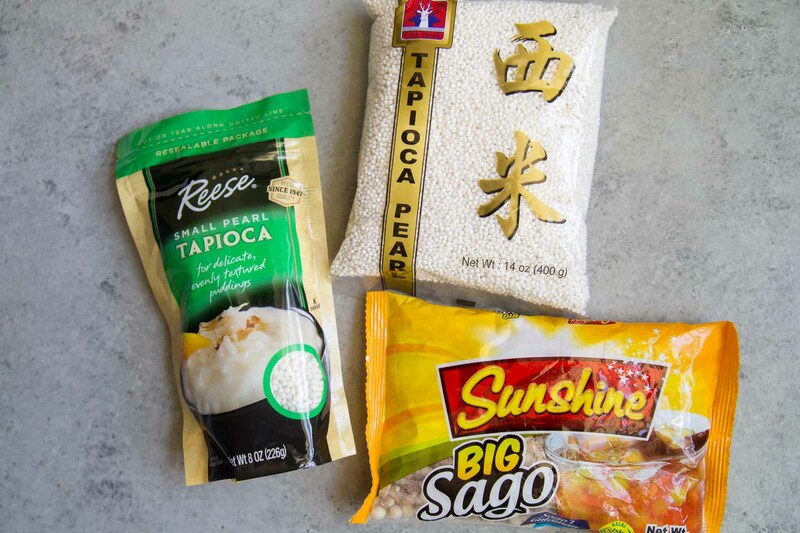 There are numerous kinds of tapioca balls ranging in size, color, and flavoring. Dried tapioca pearls are bright white in color. The dried pearls are cooked in hot water until they turn translucent and float to the top. Cooked tapioca pearls can be eaten cold, at room temperature, or warm. Camote (also spelled kamote) is sweet potato. There are different varieties of sweet potatoes all with varying flesh colors and starch levels. 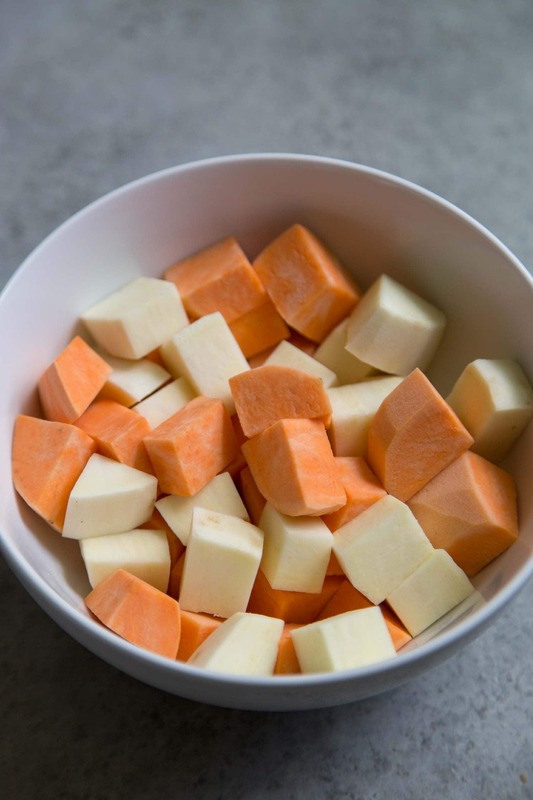 Any kind of sweet potato or yam will work in this recipe. 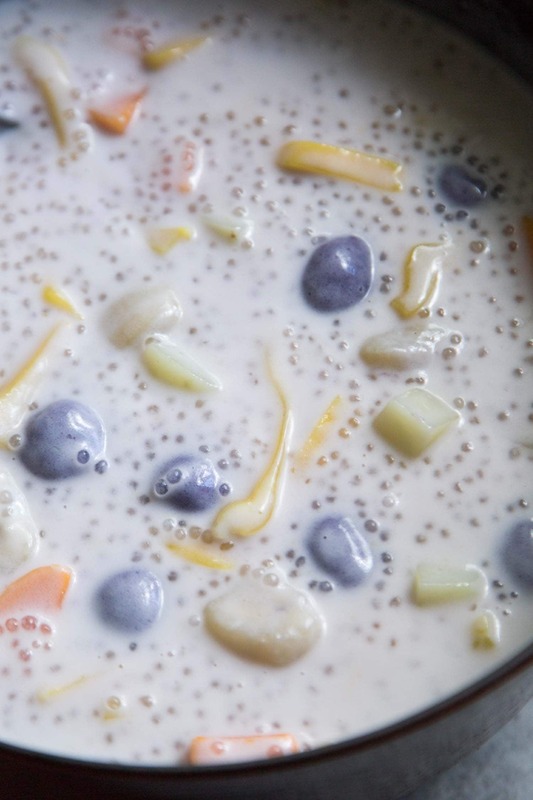 Ginataang bilo-bilo is also called ginataang halo-halo. “Halo-halo” translates to mix-mix. Halo-halo is a layered ice cream sundae-like dessert consisting of several components all mixed together. The colors in this ginataang is similar to halo-halo, hence the name. The soup will start off rather thin, but it will thicken as it cools. It will also thicken depending on the sweet potatoes used. I like to keep the ginataang bilo bilo in a slow cooker under the “keep warm” setting. This will keep the soup at the perfect temperature. Since all the components of this dessert soup are soft, I like to serve it with caramelized banana on top. This adds much needed crunch and a bit of extra excitement! Plus, it makes it look a bit more fancy. This is wonderful to serve during the holidays. Sweet warm soup on a chilly night is perfect. It’s also a great conversation topic. 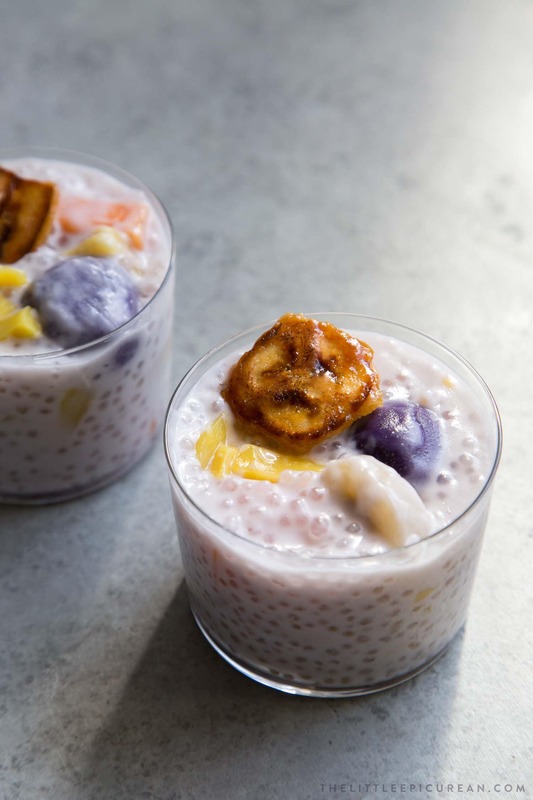 Did you know most Filipino desserts are gluten-free and dairy-free? 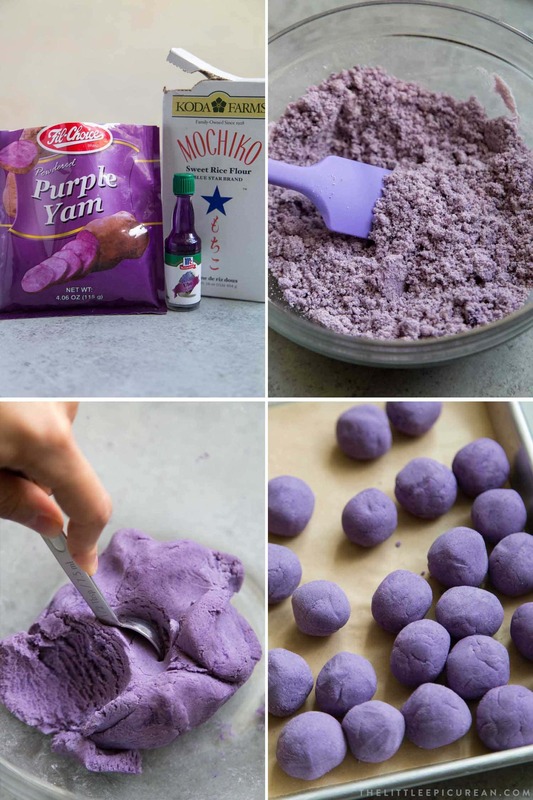 In a large bowl, whisk together rice flour and ube powder. Add ube extract and water. Use a sturdy spatula or wooden spoon to mix ingredients together until a dough forms. Use your hands to knead the dough smooth. Use a 1/2-tablespoon to portion out dough. Roll into 24 balls. Cover with plastic wrap and set aside while you prepare coconut soup. To cook tapioca pearls: Bring to a boil about 3 cups of water. Add dried tapioca pearls and let boil for 5-7 minutes. At this point the pearls will start to float to the top. Remove from heat and cover pot. Allow to sit in hot water for another 5-7 minutes until tapioca pearls are translucent. Drain and set aside. In a large pot, mix together water, coconut milk, and sugar. Stir contents together and bring to boil until sugar has dissolved. Reduce heat to a simmer. Add sweet potato and bilo-bilo. Let simmer for 5-8 minutes until sweet potato is tender. Add in saba banana, jackfruit, and cooked tapioca pearls. Stir to combine and let simmer for another 3-5 minutes until saba banana is tender. Remove from heat and serve warm. Coconut soup will thicken as it cools. Jackfruit: use fresh or canned jackfruit. If using canned jackfruit, drain syrup. Slice jackfruit flesh into strips. Your ginataan brought back memories of my mom preparing this when my sisters and I were kids. It was my youngest sister’s favorite so a big pot never lasted very long.